[prMac.com] Bethesda, Maryland - Code Obsession is proud to announce the release of Observatory 1.3, a large update to the only image management application that is specifically designed for astronomy. The update adds SkySafari integration, overlays and automatic tagging for variable stars, double stars, confirmed exoplanets, and much more. * Display thumbnails, previews and metadata of FITS, XISF and SBIG images in Finder and other applications. Find images by exposure time, focal length, detector temperature, right ascension, declination and more using Spotlight. * Relate image pixels to actual sky coordinates with Observatory's plate solver or its interface to the astrometry.net blind plate solver. Plate solved images are automatically tagged, so you can find them back later by object identifier and category. 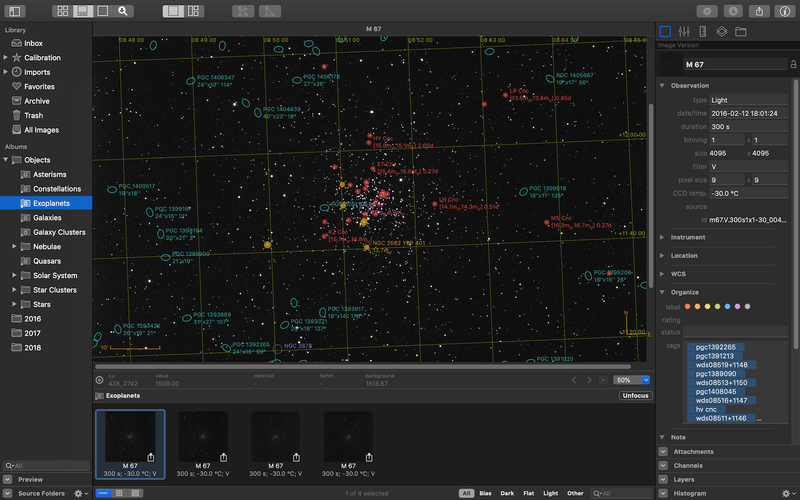 * Discover what's in your images by overlaying millions of stars, galaxies, planetary nebulae, confirmed exoplanets and other objects of the Messier, NGC/IC, Tycho-2, CGPN, GCVS, WDS and PGC catalogs, or add the UCAC4 and USNO-A2.0 catalogs for an additional 500 million stars. * Create multiple libraries and keep your images organized without copying, moving or altering them. Edit metadata, ratings, color codes, notes and attachments for individual images or multiple images at once. * Aperture photometry with subpixel accuracy and error estimates, astrometry, image blinking, image statistics, and more. * A nondestructive preprocessing workflow without the hassle of intermediate files. Calibration; cosmetic correction; binning; debayering; background neutralization; color balance; flatten background; chromatic align; register; normalize and stack. * Open FITS, XISF and SBIG images at full bit depth in Acorn with help of our Acorn plugin. 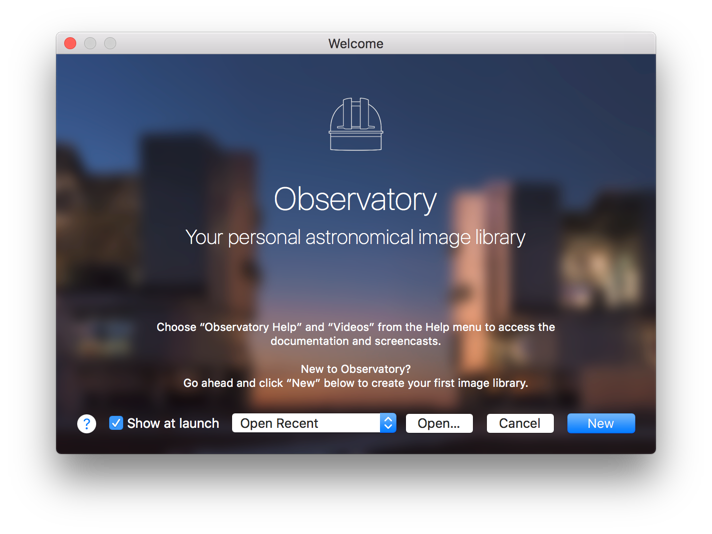 Observatory is $79.99 (USD) and available worldwide exclusively through the Mac App Store in the Photography category. For more information, please visit Code Obsession online. Code Obsession, LLC is an independent Mac software development company based in Bethesda, Maryland, devoted to developing delightful astronomy software for the Mac. All Material and Software (C) Copyright 2018 Code Obsession, LLC. All Rights Reserved. Apple, the Apple logo and macOS are registered trademarks of Apple Inc. in the U.S. and/or other countries. Other trademarks and registered trademarks may be the property of their respective owners.